You know when to shake and when to stir. You’ve read up on the South’s favorite cocktails. You’ve got your Southern spirits lined up on the shelf. Now all you need is … everything else. There’s nothing more rewarding than coming home from a long day and making the perfect martini or Old Fashioned. Every Southerner knows that a well-stocked bar is necessary, whether you’re hosting a few or the many. The good news is that you don’t have to know it all or spend it all to have it all in your home bar. Here are the essential bar tools that you really need. Perfect for shaking up and “waking up” your spirits, a Boston Shaker is important for mixing up margaritas, cosmopolitans, mojitos and other cocktails with citrus or syrup. Who doesn’t love the tempoed beat of a sh-sh-sh-shaken cocktail? Don’t just eyeball it; be precise in your measurements to ensure your cocktails are well-balanced. You really only need one or two jiggers, but it’s important that you have measurements for 1/4 ounce, 1/2 ounce, 1 ounce and 2 ounces, as these are common measurements in cocktails. Ensure only your drink makes it into your drink by straining out any ice that might want to go along for the ride. You can use either a Hawthorne or Julep strainer, but if you really want to make sure you only get the good stuff, do a double strain through a fine mesh strainer. If you want to make it easy on yourself, we recommend the Crafthouse By Fortessa Shaker Set, which comes with a Boston shaker, Hawthorne strainer, muddler and a 2 ounce jigger. If you’re making stirred cocktails, a mixing glass and bar spoon are must-haves. Stirring your cocktails not only takes the temperature down but also dilutes some of the bite from the alcohol, and a bar spoon is the perfect length and size for the ideal stir. If you like Old Fashioneds, we recommend this mixing set, which comes with all the necessities plus two double Old Fashioned glasses. Wine glasses — We recommend separate glasses for red and white, but a universal wine glass would also be sufficient and space-saving. Champagne coupes — We prefer coupes to flutes, since you can serve both champagne and cocktails in coupes. But if you don’t want to choose, go ahead and get both. The type of ice you use in a cocktail does matter, so make sure you have an ice bucket and scoop at the least. You might also want ice spheres and large cubes, depending what's on the drink menu for the evening. If you want to snazz up your bar a bit, add these extras to your setup and you’ll be ready to open up shop for your friends and family. Bitters are an important ingredient in many cocktails, as they enhance the makeup and flavor profile of your drink. You can really go wild with a bitters collection, because each one’s flavor profile is different and opens up the possibilities for all kind of cocktail creations. For a beginner, start with aromatic, orange and Peychaud’s bitters. 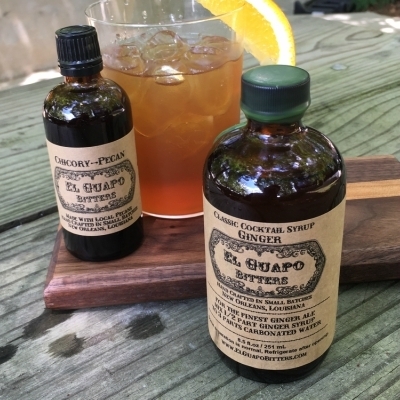 If you’re a bit of a cocktail connoisseur, we recommend the El Guapo Bitters essential set. If you’re a fan of the caipirinha or need to muddle some mint for your julep, no tool makes it easier than the muddler. For a high-end look, opt for a wooden option. Yes, you can stick with tonic water from the grocery store. Or you could amp up your G&T (and many other drinks) by adding one of these Southern tonics to your bar supply. Simple syrup, sorghum, maple syrup, honey, sugar and molasses each find home in a cocktail. Add one or all to your bar, and the possibilities open up for invention and experimentation. At the very least, we recommend keeping simple syrup (purchased or homemade) and sugar on-hand. Our pick is the ginger honey simple syrup from Hudson & Lee. It’s always a good idea to keep sodas available for those under 21 or anyone who isn’t imbibing. Cheerwine, Coca-Cola and Blenheim Ginger Ale are all signature Southern sodas to add to your bar. Bonus: If you want the best of both worlds, any of these cocktails made with Southern sodas will get your bar-ty started. What’s a martini without a twist? Get the perfect peel or top-of-the-line twist with tools made specifically for citrus. Part education, part inspiration, part entertainment: A good cocktail book makes an excellent addition to your bar, and gives your guests something to peruse while you’re shaking, stirring and mixing. We like the classic tome, "The Craft of the Cocktail; Everything You Need to Know to be a Master Bartender, with 500 Recipes," as well as the more recent book, "Speakeasy: The Employees Only Guide to Classic Cocktails Reimagined." Ready to start shaking things up at your home bar? Check all of our drink-related stories and recipes for inspiration. Cheers, y’all!